This is a familiar saying that often refers to our need to improve things when they don’t really need improving. The problem is that for many churches, the question is “when is it broken enough?” It doesn’t matter if it is broken or worn, but when is it to the point when we HAVE to fix it or get a new one. Often times, when things are broken or the way things are done doesn’t work anymore, we still tolerate it due to lack of energy, time, leadership, resources, creativity, or money. Back in August 2010, I wrote a blog about how a broken pew inspired the worship team at my church to re-evaluate how we worship. There was no urgent need to re-evaluate how we worship, except that the broken pew began to spark conversation about our worship style. Although we could have simply fixed the pew (which we have done in the past to many of the other ones), we discussed how we may transform some of them given the needs of our congregation. One of the challenges we constantly face is how to worship as an intergenerational community. However, one thing that we are intentional about is creating a space that is family-friendly. Although we do provide nursery care that is close to the sanctuary, we also allow space for babes in arms and crawling toddlers. 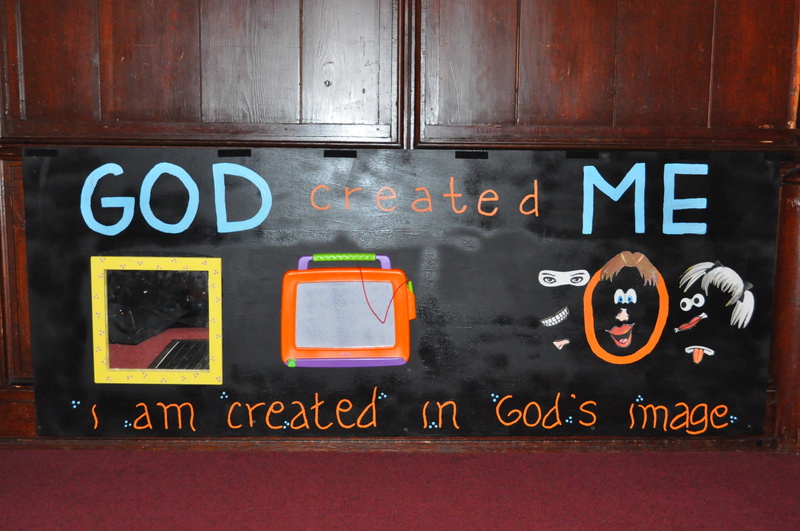 This provided us an opportunity to transform some of our broken pews into interactive boards that would teach theological concepts in tangible and concrete form. 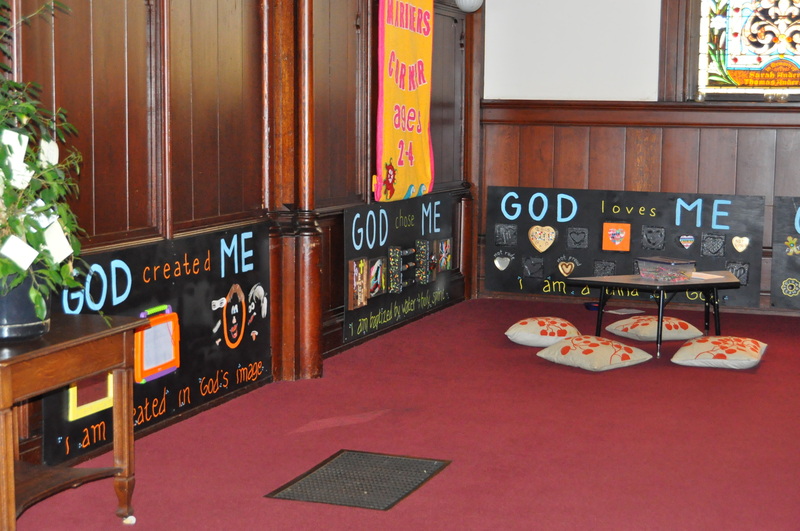 Below is a slideshow on how I transformed four pews into four interactive boards that were adhered to the backs of these pews. Most of the materials were old, unused items found in the storage closets and attic of the church and found at SCRAP (Scrounger’s Center for Reusable Art Parts). It’s amazing what you can find in a church that is over 100 years old. Also, if you can find an art store that reuses junk for art parts, you can find a lot of items for minimal cost. When I did have to purchase items, I mostly went to Home Depot, Michael’s, and Oriental Trading Co.
Board #1: God Created Me – opportunity to examine one’s face, draw their own creation, and create their own face. Magnets – (SCRAP) – used old refrigerator magnets to glue face parts onto. 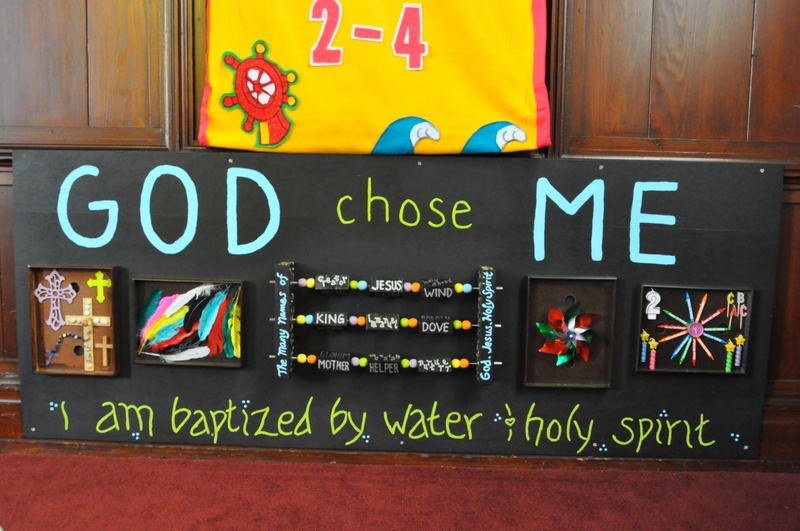 Board #2: God Chose Me – opportunity to feel different symbols of baptism and explore different trinitarian names. Board #3: God Loves Me – opportunity to explore different characteristics of love from 1 Corinthians 13 and make their own love notes by rubbing hearts using crayon & paper. 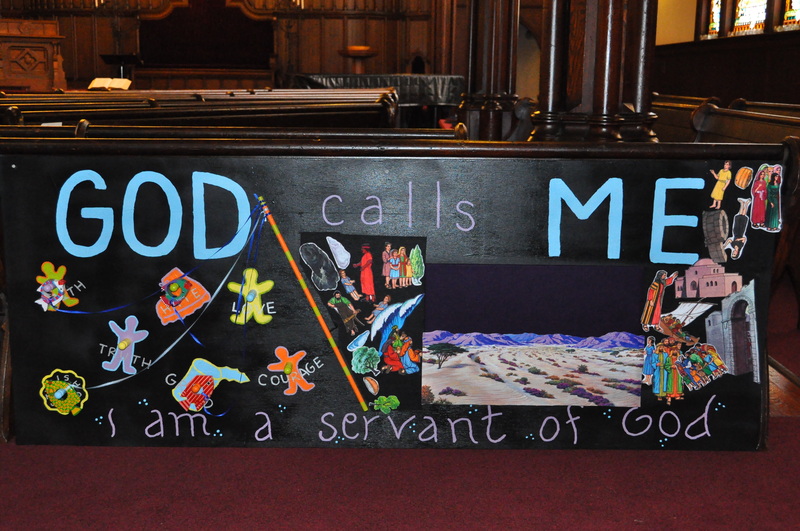 Board #4: God Calls Me – opportunity to recognize the characteristics of a disciple and use their imagination by playing with different characters in the Bible. 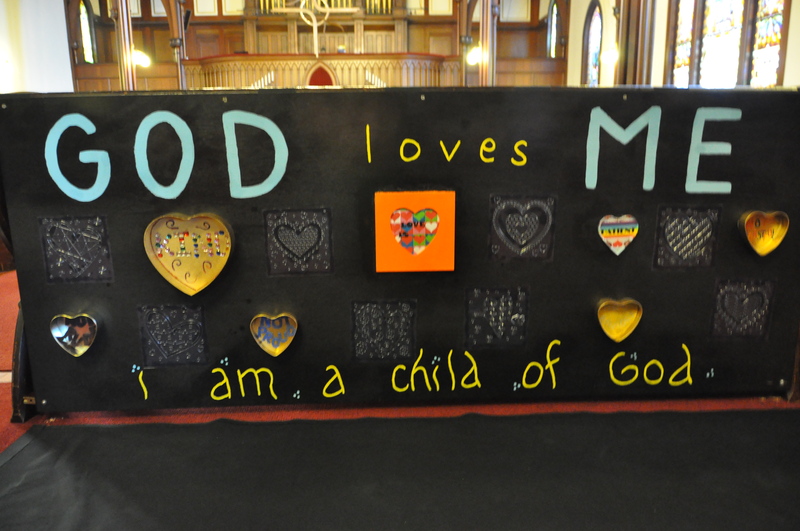 Note: Recently, these interactive boards have moved from the back of the broken pews to the corner of the sanctuary that we designated as a toddler area. I am really thinking about doing this in our toddler corner. Except we used our broken pews for a deck at the manse. Thanks for the inspiration. Jeff is so right you are creative and imaginative! This is absolutely amazing — makes my day to see a church thinking creatively AND theologically for children. nice idea. better than clamping fidgety toddlers on laps, or shushing them for asking a question or just talking. the tactile approach works well with this age group, and they remember the things they touched, moved and looked at. thanks for sharing.